YOUR INTENSIVE CARE HOTLINE - My 78 year old Mother had two cardiac arrests, are they keeping her ventilated and sedated for too long? My 78 year old Mother had two cardiac arrests, are they keeping her ventilated and sedated for too long? My sister is in Intensive Care after a car accident with multiple fractures. The doctors want us to “pull the plug”, we want to keep going, what are our rights? This question from Ronald is an excerpt from a 1:1 phone counselling and consulting session with me. my Mum who’s 78 years of age had a cardiac arrest two weeks ago and another cardiac arrest four days later. The first cardiac arrest was at home and luckily my Dad was there and called an ambulance straight away and the Paramedics were there within minutes. She then had the next cardiac arrest within four days in Intensive Care. She also had two cardiac stents fitted in the meantime and she has now been put on the dialysis machine to help her kidneys. She was in “cooling therapy” for three days and heavily sedated. She was also on the balloon pump for three days after the second cardiac arrest but it has come out now and they are saying that her heart is still weak after the cardiac arrest. They have been doing ultrasounds of her heart, apparently she still needs some blood pressure medications and also needs medications to get her heart muscle beat stronger. Apparently her ejection fraction is only 20% but I’m not quite clear what that means. She’s also in an irregular heart rhythm now, what they refer to as atrial fibrillation. Again, I’m not quite clear what it means. Maybe you can help. She was sedated for 11 days in total and it has taken 5 days for her to open her eyes, so should she still be ventilated with a tube down her throat or should they be trying something else??? Apparently there is no brain damage and the CT of the brain was normal. Any advice please would be much appreciated! It’s been very difficult and frustrating for me and my Dad and I don’t know which way to turn. They said she should have opened her eyes within 72 hrs but it took 5 days instead! Now she’s blinking eyes to questions and trying to move her arms. What do you think, should she be doing more of it, shouldn’t she be “waking up” now??? thank you for your questions and thank you for using my 1:1 phone counselling and consulting service. First of all it’s good to hear that there is no brain damage and it’s good to know that your mother survived both cardiac arrest situations! Those are the good news! The challenges during those situations are indeed to look at what’s happening after people have survived such a major event and how they can get back on track as quickly as possible and get out of Intensive Care alive to take the next steps towards rehabilitation if possible at all! Let’s look at your mother’s situation in detail. Firstly, your mother survived two cardiac arrest situations within four days without having any brain damage. That I believe says a lot about your mother’s will to live! Sometimes there is also a bit of luck involved, as you’ve mentioned the first cardiac arrest was at home and your Dad was doing all the right things and the second cardiac arrest was in Intensive Care, and if there’s any place you ever want to have a cardiac arrest it’s either Intensive Care, Emergency room or in the operating theatre because there’s trained staff around to manage those situations. Next, she came to Intensive Care was induced into a coma and she was put in cooling therapy, which is standard treatment after cardiac arrest in order to protect the heart, the brain and all other major organs. The aim during cooling therapy is to get the body temperature down to around 33C (=91.4 F) and therefore minimize oxygen consumption for those organs to slow everything down and get the heart and other major organs to recover if possible at all. Next, she needed the Intra-Aortic Balloon pump to increase oxygen perfusion to the heart which has shown to be effective after cardiac arrest. In the meantime she has also gone into Atrial fibrillation which is an irregular heart rhythm and this can happen after such events like cardiac arrest, heart attack and/or after open heart surgery. Atrial fibrillation (also known as “Afib”) is basically when the two major parts of the heart, the atrium and the ventricle are not beating in sync. During all of this she has been placed in an induced coma and she has been ventilated with a breathing tube. Furthermore, she is needing some inotropes/vasopressors because her blood pressure is low and because her heart muscle is weak. Therefore your mother is needing either Adrenaline (Epinephrine) and/or Noradrenaline (Norepinephrine) to maintain a sufficient blood pressure and she also needs some Milrinine (Primacor) or Dobutamine to increase the contractility of her heart due to her heart muscle being weakened after the cardiac arrest. In some rare cases Levosimendan(Simdax) is also being used for severe heart failure. They are now checking your mother’s heart function regularly with heart ultrasounds and they may have also done some cardiac studies with a pulmonary artery catheter. Your mother is now at the point where they have been able to remove the Intra-Aortic Balloon pump and where she had no more incidents of any further cardiac arrests, which is a positive sign. Next, with the two cardiac arrests and everything that went along with it, she has gone into acute kidney failure, hence why she needs the Dialysis machine. Why your critically ill loved one might need Dialysis (Kidney machine) or Haemofiltration for Kidney Failure(Renal Failure) and is having a Dialysis machine attached to them! Again, this type of situation after two cardiac arrests, two Stents(PTCA’s) being placed, being on the Intra-Aortic Balloon pump for a few days and Inotrope/Vasopressor dependent is nothing unusual. Think about it. With the heart being severely weakened after two cardiac arrests and with blood pressure low as well as being in cooling therapy for several days, the kidneys would have been damaged due to low blood perfusion from low blood pressure and from being cooled. 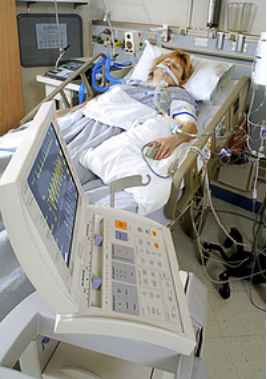 Many critically ill Patients in Intensive Care go into acute kidney failure especially after cardiac arrest, heart attack, heart failure but also after Multi-trauma and severe bleeding. The good news is that the kidneys often recover(in almost 90% of all Patients that require Dialysis after acute kidney failure) after use of the Dialysis machine if no other kidney issues have been present prior to the ICU stay. Next, you are saying that they are doing regular ultrasounds of the heart and that her ejection fraction(=is a measurement of the percentage of blood leaving your heart each time it contracts) is only around 20%. It’s great to know that you are really on the ball and it’s great to know that you are asking them all the right questions, well done! I’m not surprised that ejection fraction is only 20% after two cardiac arrest events. This low ejection fraction is a sign that the heart muscle is weak and it means that a low blood pressure can be expected because of low contractility of the heart muscle. A low ejection fraction would have also contributed to your mother developing acute kidney failure. In the ideal world all of the issues that your mother developed because of the two cardiac arrests should be solved before she’s getting out of the induced coma, but a situation after two cardiac arrest events can be quite complex which is certainly the case in your mother’s situation. Therefore coming to the point where your mother has now been in an induced coma for two weeks and has SURVIVED TWO CARDIAC ARRESTS is rather remarkable! You also haven’t mentioned anything about the Intensive Care team being negative, which I think is great! Most families in Intensive Care who encounter a similar situation, usually seek out my 1:1 counselling and consulting because they are finding a very negative Intensive Care team. So far, from what you are describing you haven’t encountered any negativity and from my perspective they are doing all the right things. Now I want to address your question why your mother may not be “waking up” yet. It’s probably because she’s not ready yet. Now, I know how frustrated you and your Dad must be to watch your mother go through all of this treatment without being able to talk to her. Again, after such a severe critical illness and after being so close to death, please give your mother the time she needs to get through this and this includes letting her “wake up” in her own time. During the cooling therapy your mother would have been heavily sedated with Midazolam(Versed) and either Morphine or Fentanyl. Both Midazolam(Versed) and Morphine or Fentanyl are long acting sedatives and opiates(=pain killers) and they take a relatively long period to get out of the body system especially in kidney failure! And yes, the 72 hour time frame they have referred to after trying to wake her up after ceasing the sedation should have been sufficient time for your mother to “wake up” and it took five days instead! I’m not too worried about it being five days instead of being three as long as she keeps doing all the right things and she is doing all the right things! She’s blinking eyes and she’s moving her arms, that’s great news! I can only strongly recommend to check out those resources here when it comes to your critically ill loved one not “waking up” after an induced coma! You get all the information in there how long it should take for a critically ill Patient to “wake up” after an induced coma! From everything you are describing Ronald, your mother is making slow but steady progress! 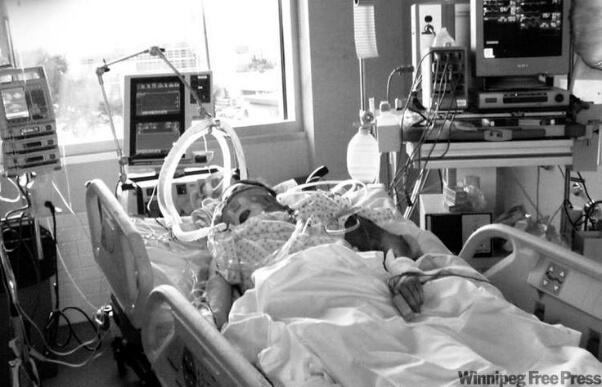 No matter how much you, your family and the Intensive Care team want to speed up the process of “waking up” after an induced coma, critically ill Patients do it in their own time and your mother won’t be any different from it. Again, keep in mind, your mother had two cardiac arrest events within four days, she was on the Intra-Aortic Ballon pump, she had two stents fitted and she is now in acute kidney failure, that’s a lot to deal with! Therefore as long as your mother keeps making progress that’s all that matters for now! Give her the time to recover in her own time! And yes, she needs to get off the ventilator, but given that she was heavily sedated and is so sick, she may need a few more days to get off the ventilator. Also, you want to make sure that your mother is really ready to be taken off the ventilator, because taking her off the ventilator too early could also be detrimental for her recovery, therefore give her a few more days. Imagine taking her off the ventilator too early and then she might have another setback. This could be very detrimental especially with an already weakened heart. In the bigger scheme of things, having survived two cardiac arrest events within four days, no brain damage and now having acute kidney failure, your mother is allowed to take her time to “wake up”. It sounds to me like she’ll get there. Intensive Care is often a marathon and not a sprint. Two steps forward and one step back. Your mother is already making progress, give her a few more days and she’ll be off the ventilator and be more awake! So far your mother is not in an unusual situation after two cardiac arrests, two stents(PTCA), the Intra-Aortic Balloon pump, Atrial fibrillation, Acute kidney failure, Induced coma and ventilation with a breathing tube. I hope that helps Ronald! Take care, wishing you and your mother the very best!